We live in blessed times. I mean, seasonally. It’s late-spring, and we have things popping out of plants that are incredible and edible (and not edible, but fragrantly incredible, like wild lilacs, too). I recently had the plum privilege of being a judge for a cookoff held by GrowNYC, where I got to observe the making of, taste the outcome of, and help decide the winner of two very excellent dishes prepared by local restaurant chefs. Held in partnership with Northwest Atlantic Marine Alliance and Blue Moon Fish, it was the annual Seafood Throwdown and chefs had to build their dish around one secret seafood ingredient, which happened to be bluefish this year. Through that, I was reminded of how strongly our food culture emphasizes protein as a base upon which to create the rest of the meal around. With an amazing protein, everything else is interchangeable: seasonal veg, different flavor and cuisine directions, etc. But what if you’re a non-chef, and you don’t have an amazing protein? Or what if you just can’t rationalize buying an expensive and amazing protein when you have enough amazing produce to feed an army thanks to your CSA? Well, I found myself in this position after picking up one of the first shares of the summer season from Local Roots CSA. What, then—if you don’t have the means or the time to pick up an amazing protein? This dilemma is essentially the premise of my diet, and what makes up the bulk of this blog’s recipes. And I know anecdotally that it’s something shared by a lot of people around me. Prime, fresh and awesome proteins are easy to create a meal with. But they’re simply inaccessible much of the week, reserved to the weekends or those times that we do manage to schlep out to or decide to splurge at an excellent fishmonger or butcher shop. One of my favorite classic cookbooks is the 1950s Talisman Italian Cookbook by Ada Boni, a homey, Italian housewives’ staple. Many of its recipes fall under what we might call “marginally meated” dishes. I mean the stuff that has a spat of anchovy paste or a teensy bit of pancetta for flavor, not substance. It’s the kind of cooking that’s very familiar to me from my mom’s homestyle Chinese cooking, too, where a burst of minced pork shoulder might add a little density to an otherwise lean stir-fry of silken tofu like in ma po tofu. Or something like that. Main point: most home cooks don’t feel that they can make anything good, least of all anything special, because they don’t have an amazingly special protein at their beck and call, for their wit and whimsy. But if we look at humble tradition, we can use proteins sparingly, or rely on cheap, more readily accessible proteins like legumes and eggs easily. Much of our restaurant culture and now meal-kit delivery culture seems to think you’re either all-vegetarian or not. But good-quality, humanely raised animal proteins are expensive, and if that’s the kind you prefer to buy we find ourselves paring back. It’s happening all around us, too, with more vegetable-forward cookbooks as well as restaurant chefs not necessarily adhering to strict vegetarianism but not making animal protein the center of the meal. It’s an especially good time of year to start practicing this more now that we have so many amazing vegetables thanks to the beginning of the summer harvest season and/or your CSA. It’s true that it makes cooking something awesome more challenging. But I like to think that’s part of the fun. You can have a throwdown in your own kitchen, like I did with my Local Roots CSA batch. And when you do, and do it somewhat well, you can award yourself at the end. Cook the couscous according to the directions on the package and let cool, uncovered as you prepare the rest of the ingredients. Trim the sugarsnap peas by breaking off the stem and pulling the center threads off. Trim the kale leaves from the tough ribs by holding by the stem and stripping down. 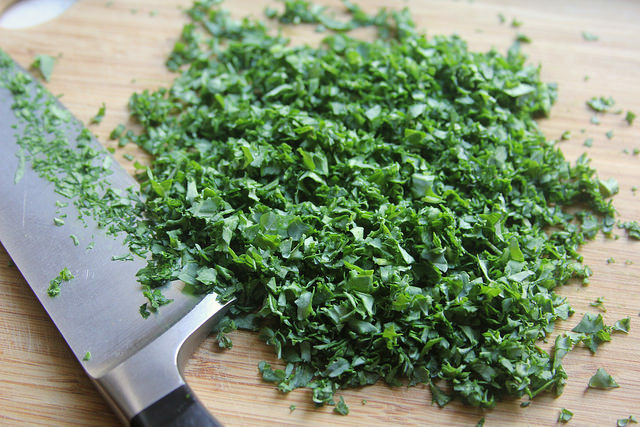 Finely chop the kale leaves and combine with the cooled couscous. Add about 1 tablespoon of the olive oil, salt and pepper to taste, and an optional squeeze of lemon juice. Heat about 1 tablespoon of oil on a heavy-bottomed pan (such as cast-iron) and once the oil is very hot, add the sugarsnap peas along with a pinch of salt and pepper. Stir about 1 minute until their color has just turned turned to deep-green, then remove from pan. Add another small pool of oil and cook the mustard greens in the same pan, adding a pinch of salt and pepper, and stirring occasionally until just wilted throughout. Remove from heat. 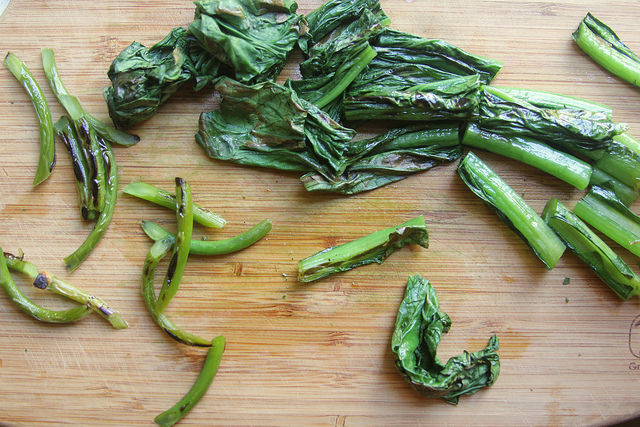 Once cool enough to handle, chop the mustard greens along their length into 1-2″ pieces. In the same pan, add another splash of oil and once hot, add the garlic scapes. Let cook without touching and after about 1 minute turn to sear the opposite sides. Turn off heat and let the garlic scapes soften another 2-3 minutes on the hot pan. Remove and once cool enough to handle, cut the garlic scapes along their length into 1″ pieces. 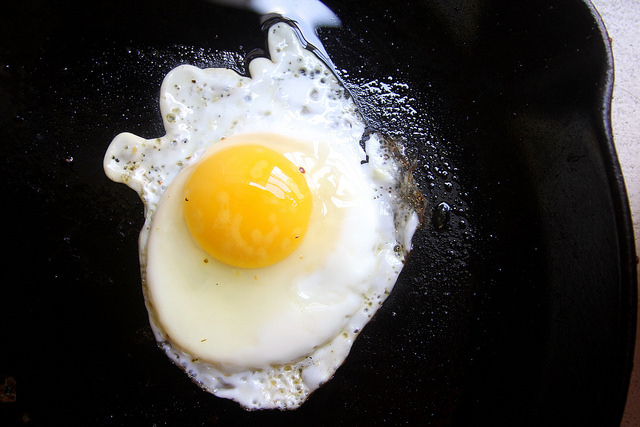 In the same pan, add another tablespoon of oil and (working in batches of 2 if necessary), fry the eggs sunny side-up. 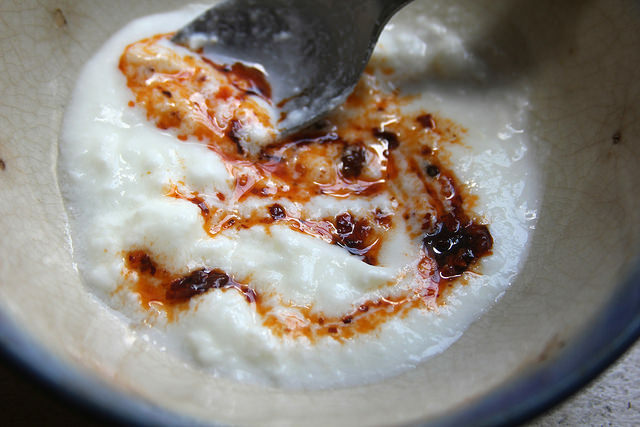 In a small bowl, combine the yogurt and hot sauce. 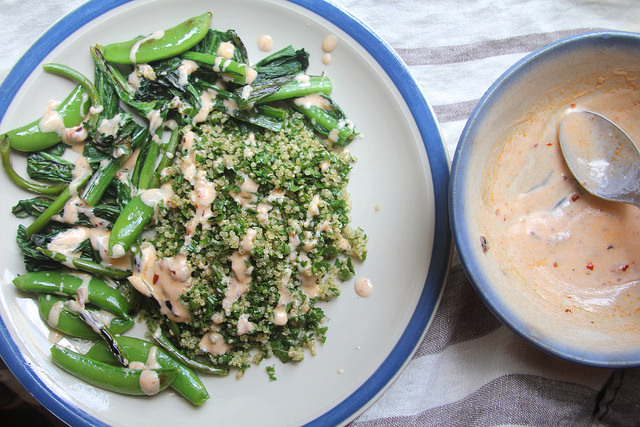 To assemble the plate, spoon the kale quinoa into each and arrange the seared vegetables over. Drizzle with the spicy yogurt sauce. 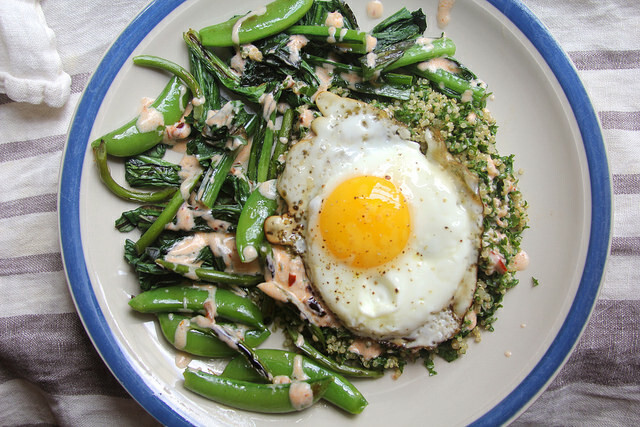 Top each plate with a fried egg, and serve immediately. As a fellow New Yorker this is awesome concept and so true. I love this recipe. I am so going to try it! Great concept and well written:-) I often go here to look for inspiration. This dish is one of my favorites and my boyfriend loves it as well! Just stumbled across your book, The Art of Eating In and couldn’t put it down. 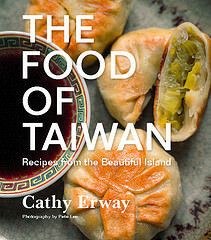 So delighted to see so many interesting recipes on your blog–I live in Canada, and eating out is a big thing in my city too–really feeling pulled to learn more about sustainable food. Thanks for such a great introduction to many important ideas!